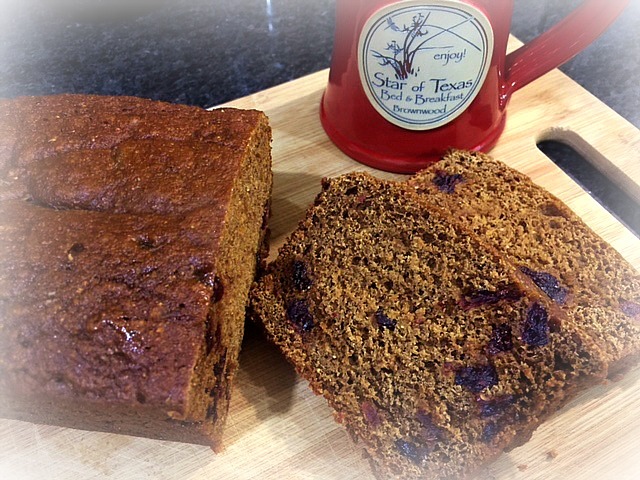 Recipe for wonderful baked Boston Brown Bread, that we toast for guest at the bed & breakfast. Nothing is more enjoyable to me than baking fresh loaves of bread. I have always loved the taste of Boston Brown Bread, but didn’t want to mess with the process of steaming it on top of the stove. Well, one of the baker’s from King Arthur Flour, experimented with baking it and has found an easy and time saving way to bake it in the oven. The mix of flours, buttermilk and molasses with currants ( and by the way didn’t have them so added dried cranberries) just smells heavenly when baking. The results were so great, we have been slicing it thick and toasting it with a slab, and I mean a slab of fresh sweet cream butter on top. It keeps well in the refrigerator and toast up just beautiful. If you are one who loves to bake, then you must try out this wonderful recipe from the baker’s at King Arthur Flour. This entry was posted in From the kitchen, Recipes and tagged baking bread, boston brown bread by admin. Bookmark the permalink.